While my cousin Angie was in town visiting again, we had a chance to do a little shopping together, and I found these adorable plates at Anthropologie! I made another rhubarb tart that same night, and couldn't wait to use my new plate for the pictures. This time around, I arranged the rhubarb batons in a different pattern - instead of lining them perpendicular to the edge of the tart pan, I lined them up to follow the curve of the pan, which ended up looking like an octagon design. To accompany the tart, I made fresh strawberry whipped cream again (I could eat this whipped cream by the spoonful, all by itself!). 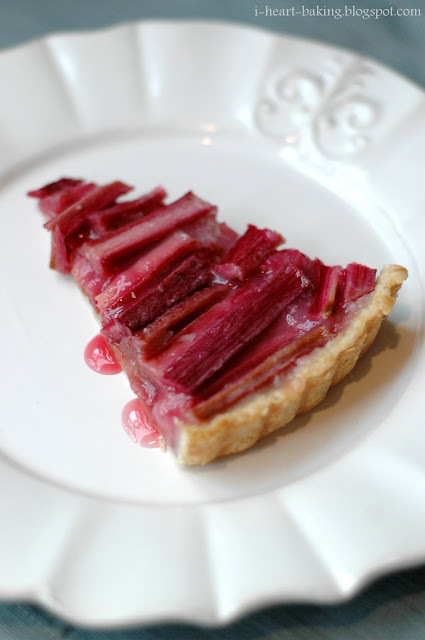 This is such a perfect summertime dessert - tart rhubarb, flaky crust, and smooth sweet whipped cream. I hope rhubarb season stays around for a while longer! That tart is so pretty! Never could be enough rhubarb for me. I've even frozen some for later in the year when it's not available anymore fresh :). This looks yummy! I made my first ever rhubarb baked good earlier this year, a rhubarb pie, and was totally enamoured with it :) it didnt look HALF as gorgeous as your tart though! What a pretty tart! The ice cream would be delicious with this!